As devoted parents, we want to get the best things we can for our children, especially on practical items like umbrellas that protect children from the rain and snow. But how many times, as a parent, have you gone out in the rain only to find that your trusty umbrella breaks as soon as you open it? If I had a dollar for every time that that happened… I’d have at least 10 dollars. So let’s save our kids by giving them the best and most durable umbrellas we can find them. In this review, then. 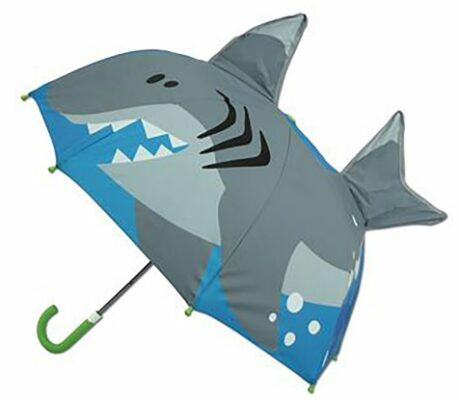 we’ll look at our top picks for kids umbrellas. Below we have a selection of kids umbrellas that are both cute and easy to hold and use. We made sure that all have great reviews and are safe for children to use, even if very young. 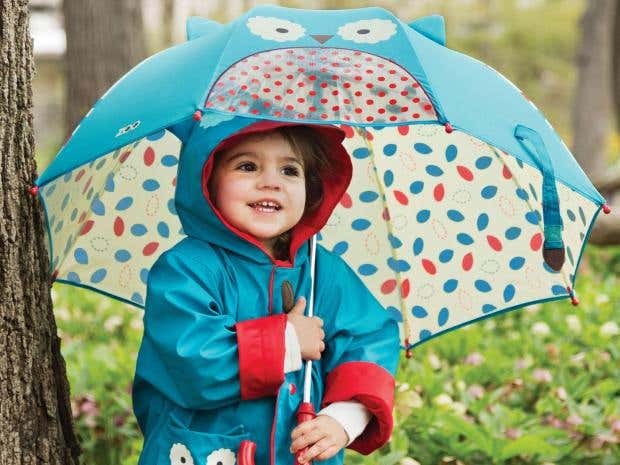 Whether they are rushing to the bus stop or splashing around in puddles and having a great time, your tot will be singing in the rain all the way to school and back with this stylish brolly. 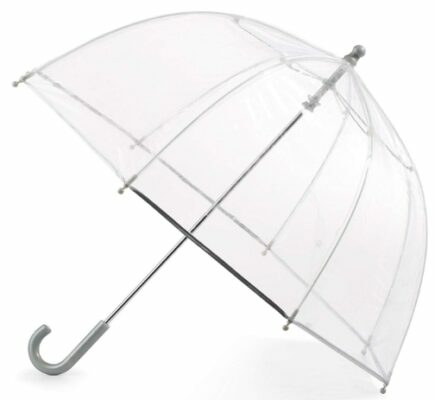 This cool kids brolly has an innovative windowpane that lets children see through the umbrella while keeping their faces dry and sheltered. 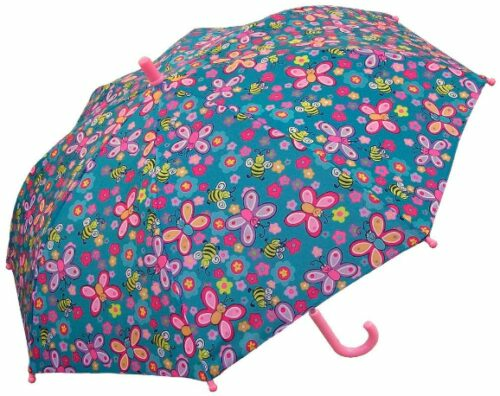 This brolly also coordinates with a matching raincoat from the manufacturer, so its perfect if your child wants to coordinate their outfit. Available in a range of colors and animal designs. The pink set will a great umbrella for a little girl. Help your kid keep dry and healthy in the wet weather with this awesome unisex umbrella. The clear canopy lets the little ones see where they are going easily, so they can avoid any bumps or knocks that they might not otherwise notice, especially in busy streets. We all know just how much children like bright and colorful things, so keep them from the sadness of the rain and drizzle with these cool children’s umbrellas. Available in a full range of cool kids designs, these umbrellas are sturdy, durable, and your kids will have no trouble opening. it has no buttons, you don’t have to worry about tiny hands getting trapped or snapped. 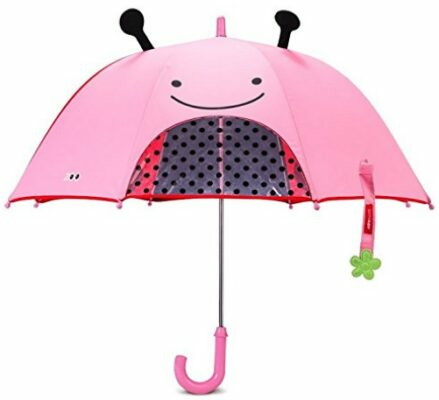 3 year old children will absolutely love this stylish umbrella, as it is big enough for them to use, but they won’t grow out of it or a few more years. It is very comfortable to hold and easy to use. This also comes available in a staggering number of different colorful designs, with everything from flowers, animals, cowboys, and sports, so you’ll surely find one that fits your child’s sense of style and interests.